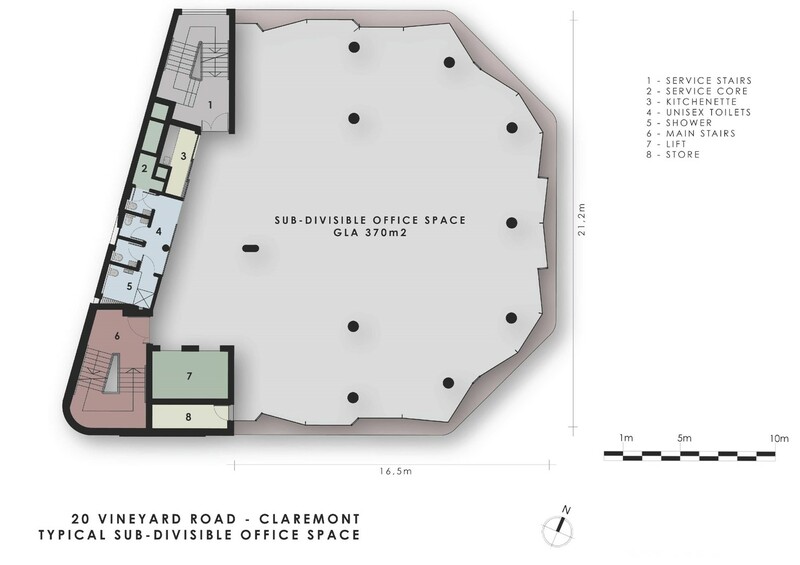 Five floors of Premium Grade Offices, built with natural materials, with floor to ceiling wrap-around glass provides a light and airy office space with views in every direction, and showcases the splendour of Devils Peak and the Hottentots Holland mountain range. An Innovative pre tensioned structural system allows for minimum internal columns, facilitating spacious uninterrupted open plan offices. The glass facade, faceted to reflect the changing angles of the sun, is punctuated with coloured glass openable panels allowing natural ventilation if required. A state of the art system of automated blinds track the sun and tilt to shade the internal office space. Two floors of parking, will create easy access for tenants. There is a single floor of upmarket retail space situated on the ground floor at street level with emphasis on a specialist boutique offering. Extra parking available across the street. Landlord provides an Installation Allowance of R762 000 towards the tenants fitout.